The easy way to change most hard-to-reach bulbs. 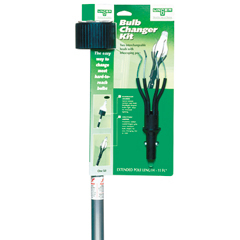 Contains everything you need to change bulbs safely and quickly from the ground. Pack includes FloodSucker Bulb Changer, StickyFingers bulb changer and 11-ft. telescopic extension pole.